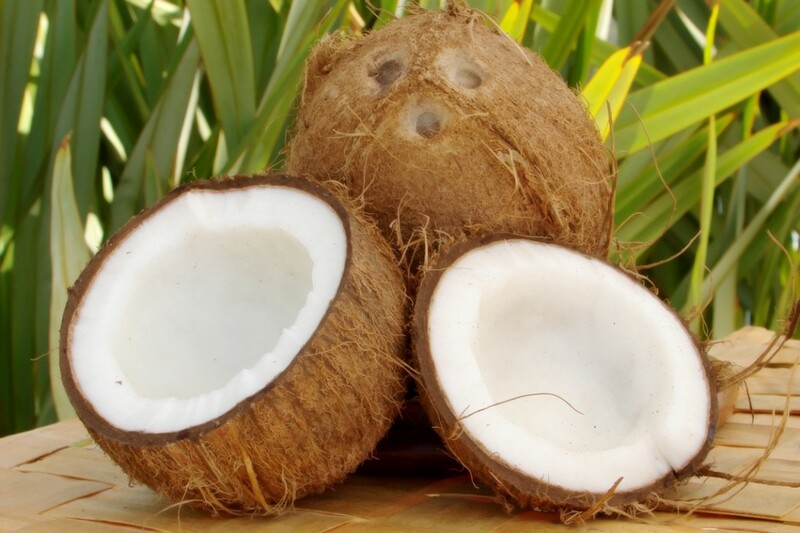 It is commonly believed that the name “coconut” was given by Portuguese sailors in the 16th century because the three holes on the coconut looked like a human face. “Coco” means “laughing face,” or “grimace.” The English word “nut” was only added later on. The coconut is not a nut at all, but a stone fruit. Coconut trees belong to the plant family known as Arecaceae and are the only species of the genus Cocos. They can grow up to 30 meters high. Coconuts are the seeds of the coconut palm tree and considered a type of nut. The “meat” of the coconut is high in protein; whereas the milk is refreshing, light and low in sugar. Aside from their culinary purposes, they are also used for cosmetic purposes and as a mosquito repellent (burning the husk). Most plants have tap roots. However, the coconut tree has a fibrous root system. The tree gains the nutrition from thin branching roots growing from the stem. Coconuts can float for long distances across the ocean and then put down roots again when they are washed ashore. There are reports that individual coconuts have even reached Scandinavia. At full capacity, the coconut palm bears fruit for 15 to 60 years, but under ideal conditions fruit production can last for up to 80 years. The maximum age of the coconut palm is between 100 and 120 years. There are over 1,300 types of coconut, which can all be traced back to one of two genetic origins from either the Pacific or the Indian Ocean. The origin of the coconut has been lost to history. Coconuts are a prehistoric plant that scientists believe came from the South Pacific around what is now New Guinea. Have you ever tried “coconut vodka”? - This drink, known as “Lambanóg” is quite strong, organic and free from additives. It is a native drink in the island of the Philippines. In well-managed 15-year-old plantations, some 9,500 coconuts can be harvested per hectare per year, and some 12,000 fruits in 20-year-old plantations. Coconut is used in a variety of cosmetic applications, more than any other fruit. Coconut oils contain median chain triglycerides which are easy to digest. The oil is source of energy and has an accelerating effect on the metabolism. Coconut oils also contain four growth hormones, that help the development of many organisms. Coconut water is considered the “father of modern tissue culture science”. They grow from sandy soils and an abundant amount of sun and rain. Often they are found near the ocean and sustainable to the excessive salt in the air. During World War II, coconut water was used as an IV drip because there was not enough blood plasma available.